‘XC’ means cross-country. ‘W’ represents its wide-ratio transmission. ‘KTM’ stands for winning. This model is a race-ready bike built for closed course enduro racing. With the agility of a 125 and enough muscle to take the fight to the 250 cc 4-Strokes, this bike punches well above its weight. 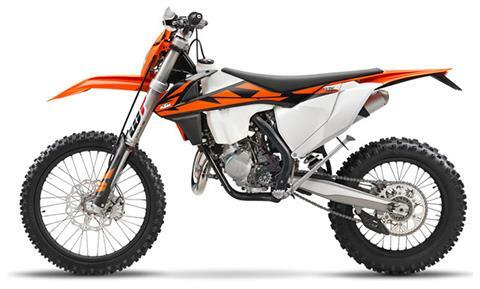 That’s why when the going gets tough, the tough get an XC-W.
FRONT SUSPENSION: The WP Xplor 48 upside-down fork is a split fork developed by WP in close collaboration with KTM. It is fitted with a spring on both sides but features separated functions for each fork leg: compression damping is fitted on the left side, while rebound is on the right. The forks can easily be adjusted for compression and rebound with the twist of a dial on the top of the forks. New outer fork tubes and a reworked setting make for more sensitivity, improved damping behavior and a reduced weight. In addition, a sealed hydro-stop guarantees excellent resistance to bottoming-out. Due to high-quality materials and a state-of-the-art production process, the new WP Xplor 48 fork – with approx. 300 mm of travel – has outstanding response and damping characteristics. A comfortable preload adjuster can be retrofitted and allows for a simple spring preload setting in three steps without tools (standard, +3 mm, +6 mm). CRANKCASES: Lightweight, die-cast crankcases featuring a high crankshaft and clutch shaft position, located close to the center of gravity, which results in optimal mass centralization and outstanding ride-ability. In addition, the engine body is extremely lightweight and compact, while still able to house an E-starter. And because looks matter, the engine covers feature an advanced surface structure in order to reduce the wear caused by the rider's boots. CRANKSHAFT: A reliable piece of engineering that has been skillfully balanced to guarantee minimal vibrations. 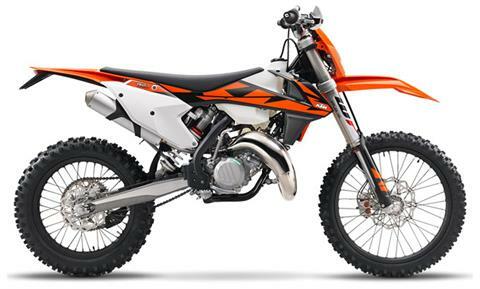 It allows a decrease of the displacement to 125 cc just by replacing cylinder, piston and head. There’s no more need to change the crankshaft. Two-in-one in no time. Front - 80/100 - 21 in.